Society in Hong Kong is becoming oppressed by China as they slowly try to erode the freedoms and rights granted to Hong Kong from the United Kingdom and subjugate Hong Kong back into the full control of China. Recently Hong Kong Football fans have been protesting against everything China has done and intends to continue doing so by booing the Chinese National Anthem, which due to the issue of proximity is also Hong Kong’s national anthem. New laws recently passed by China stating anyone booing or disrespecting the national anthem will face up to 3 years prison time has been well publicised throughout the world’s media. 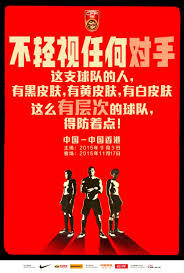 However, there was another incident that happened when Hong Kong faced China in a World Cup Qualifying game which infuriated Hong Kong football supporters, but this time it wasn’t publicised in the media outside of Hong Kong (or the attention was very minimal and difficult to locate) – The Chinese Football Association produced a batch of racist and discriminatory posters about their opponents during the qualifying campaign for Russia 2018. It warned people in China to beware of the Hong Kong national team because, “they have yellow skinned people, white skinned people, and black skinned people. We have to be careful of such multifaceted society!” Hong Kong retaliated with their own poster saying something along the lines of, “We are Hong Kong and We Stand Together!” (Rough translation if anyone can help me translate better please contact me.) This became known as the battle of the posters, and in the recent match against Lebanon Hong Kong fans made a pretty superb banner in reference to the poster war. The banner showed support for Hong Kong’s multiculturalism, it shows Hong Kong supporters standing arm in arm doing the Poznan with each other under the slogan – WE STAND TOGETHER! – one of the key messages that stood out loud and clear was that Hong Kong is proud of the multiculturalism in their City. At the same match there was a section of fans in the stadium with Chinese flags, but the police segregated Hong Kong fans who were pro-China from Hong Kong fans who were anti-China. Would it be a surprise to anyone if it was revealed that China paid those fans to go out and wave Chinese flags about? It’s great that Hong Kong is proud of being multicultural but over the border in China they’re afraid of multiculturalism. The communist party’s fear of multiculturalism is to keep the propaganda machine rolling enabling them to manipulate and control the population ensuing that the power balance remains and their rule isn’t threatened internally or externally.